Club History - Oakland Owners Club International, Inc. The Oakland Owners Club International, Inc. was formed in 1998. The four founders are LaVerne Burt (now deceased) Treasurer, Norm Hutton President, David Jones Secretary, and John Martin Vice-President. The first meeting occured in Sturbridge, Massachusetts in July of 1998. By-laws were put in place and the club was incorporated in the state of New Jersey in 2001. OOCI is fully insured by JC Taylor Insurance. As per the by-laws, a General Meeting is held every year in October in Hershey, Pennsylvania at the AACA Hershey Fall Meet at space C4F 16-18. The meeting is open to all members.The first national meet was held in Norwalk, Ohio in 1999. A national meet has been held every year since. Since 2003 it has been held in Macungie, Pennsylvania in conjunction with an AACA Meet called Das Awkscht Fescht. It is not necessary to be an AACA member or an OOCI member in order to attend that event. Anyone who attends with an Oakland recieves a plaque and is eligible to receive one of three awards given out annually; Founders Award, Reliability Award, and Peoples Choice Award. 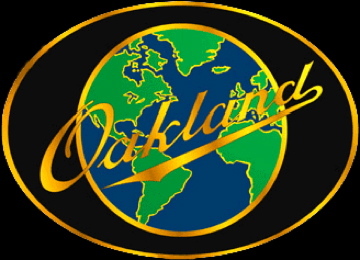 The goal of the Oakland Owners Club International, Inc. is to focus only on Oaklands, a brand of automobile starting in 1907 as an independent brand, and later joining General Motors in 1909. Oakland Motor Division later became Pontiac Motor Division in 1932. The last Oakland was made in 1931. OOCI’s mission is to support the care of and/or restoration of all Oakland Automobiles. Additionally to provide information for restoration, parts availability, and a venue for showing and driving all Oakland Automobiles. OOCI is not associated with any other organization and is a fully independent automobile club.